The borough of Petrovaradin has been a part of Novi Sad since 1928 and is a strong symbol of the city. Lying on the right-hand shore of the Danube, it is already part of Syrmia. The two cities have throughout their history been connected through several pontoon bridges and three solid bridges. Two of those were destroyed during a NATO-bombardment in 1999 but have been rebuilt. On a salient rock of the Fruška gora mountain range, which rises above the Danube’s crooks, a fort is located. After the medieval Ottoman fort had been freed by General le Croy in 1692, a new fort was built, which still exists today. 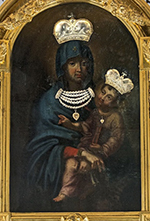 As legend has it, the Field Marshal Prince Eugene of Savoy gave an image of Our Lady of Snows, Mary with her son, to the Church of Immaculate Reception of Mary after the victory over the Ottomans on August 5th 1716. 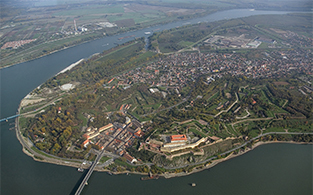 Eugene of Savoy also commissioned the biggest fort of Europe, the Fort of Petrovaradin. It covers a surface of 112 hectare. Its walls, redoubts and bastilles, its underground passageways with a length of 16 kilometres took 80 years to build and turned into a symbol of the victory over Ottoman rule and for the artistic Austrian military architecture. The fort’s attractive upper part with its bastilles and a clock tower facing the Danube has turned into a real tourist attraction and the officers’ pavilion and a long barracks are used as a hotel and seat of the historical archive nowadays. From the Petrovaradin Rock, a great view of Novi Sad and the Bačka unfolds. Today, the fort accommodates several cultural institutions such as the city’s museum, the municipal archive and Atelier 61, which shows an extraordinary collection of contemporary tapestry. Furthermore, an art academy and several artists’ ateliers are located in the fort. The lower city with its Catholic church St. George is known as a remarkable memorial of baroque architecture in the region. 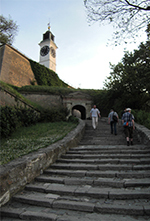 Outside the walls, the borough of Petrovaradin is located. Apart from the soldier and civil society of Petrovaradin, which mostly consisted of Croatians, Hungarians, Jews and a great number of Germans were living in the city as well. The borough of Petrovaradin on the grand crook of the Danube. LEFT: Wide stairs lead up to the fort. RIGHT: The painting is still visited by many pilgrims on the 5th of August. The Danube was already an important trade route in the 19th century. Since 2000, the fort hosts the music festival Exit, which attracts a hundred thousand fans of current music every year. 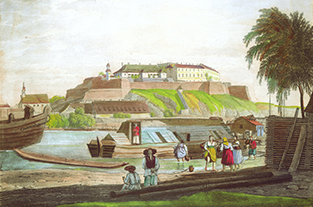 Thereby, the fort is also a unique symbol for the encounter of young people from Europe and all over the world.